Implementation is completed on the cloud so it can be done quickly and efficiently. Implementation is done on the cloud from a remote location with no hardware or software installation. As soon as the system is set up and tested, it is ready for use. Access the system from any internet-enabled device at anytime without any installation or plug-ins. Our clients work directly with one of our project managers from their first demo to post-implementation. This makes our implementation process smooth and efficient since your project manager is familiarized with your business goals right from the start. In the planning phase, the project will be discussed in further detail to ensure we are reaching all of your company goals. We will plan out customizations and any additional development work you may require. Typical customizations include specialized process flows, role-based user permissions, personalization of attributes, and reference fields. Next, if your implementation includes integrations, we will obtain API codes for the software integration during the planning phase. Finally, if your organization is purchasing scanners, your project manager will help you select the best option(s) for your organization. After the planning phase is complete, your project manager, along with our developers, will begin configuring the first version of your system. First, the basic framework of the software will be created. Next, the process flow will be configured to match your business work-flow, and user roles will be defined. We will then work together to populate the system with your organization’s inventory data. An Excel template will be provided that can be used to mass upload data. Finally, any further customizations, integrations, or external hardware will be configured. The pilot stage is when the first round of live testing can begin on the system. Training will be provided on a small scale for each of the user roles. You will work with your project manager to decide what works and what needs to be changed. This is to ensure all organizational goals and system requirements are met before it is rolled out full scale. If you are happy with the system, the pilot will be validated and ready for the final stages of implementation. After all adjustments from the pilot are made, the system will be rolled out to all users. This includes additional suppliers, vendors, customers, and internal staff. Roll out is able to happen quickly because of Clear Spider’s application service (ASP) model. The inventory software operates on the cloud so there are no software or hardware installations required. By eliminating time-consuming installations, the implementation time of your software greatly decreases. One of our goals is to get your employees and customers online as quickly as possible. Training is provided with the implementation of a Clear Spider system for all required users. 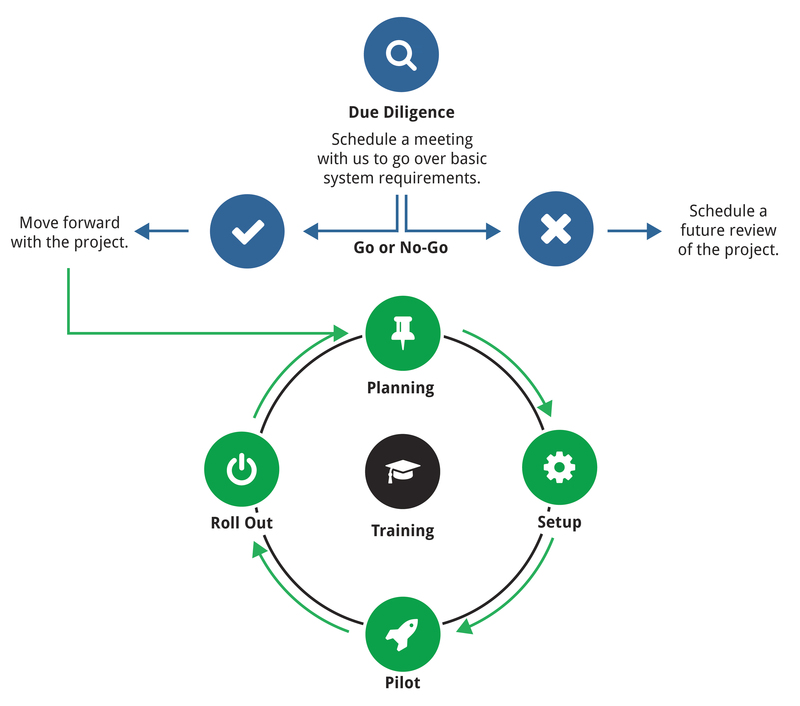 Training is an ongoing process throughout the implementation stage from the first test version to final roll out. Your project manager will be your main point of contact for any questions you or other system users may have during and after implementation. The Clear Spider system is highly flexible even after implementation. Further customizations, integrations, and additional users can always be added to the system. Since we are cloud-based, your project manager can make these changes remotely and with no down time in the system.